There seems to be a general consensus that Thanksgiving is the best of all the holidays. What’s not to love about a holiday where friends and family take time to gather around the table, share a traditional meal, and give thanks for all we have? It’s a celebration across the generations and one holiday where we all have a shared connection to the past. Central to our connection are treasured recipes that have been passed down through the years from the time your first family members arrived on the shores of America. In my family, I’m the third generation on my mom’s side and probably the 4th generation on my dad’s side. My husband is also third generation American. There are stories of heroic escapes from Eastern Europe and Russia, entries of family members who came through Ellis Island, and sagas of families being split apart until there was enough money to reunite everyone here in the land of opportunity. Every family has their own unique entry into this great land – whether you just arrived in the last decade…or if your ancestors made the harrowing journey on the Mayflower back in 1620. Living in the Boston area affords us the most wonderful living history museum, so we can see and experience the past by just taking a walk. 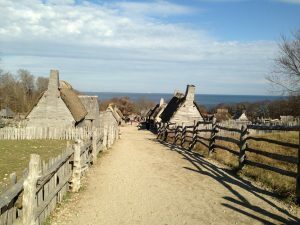 And, at Thanksgiving time, there is no better place to connect with our shared past than at Plimoth Plantation. It is a fantastic living replica of the first settlement in New England, where the Wampanoag Indians and the Pilgrim’s first met and learned to live together. During the walking tour, you get to talk to members of the Wampanoag tribe and hear from “Pilgrims” (actors who actively role play that they are living in the 1620s) about the living conditions in the new land. Each share their stories and perspectives of how difficult life has been since the Mayflower landed. The plantation is located on the shore of the Atlantic Ocean, and the view from the Common House is breathtaking on a bright autumn day. If you take a moment to stand at the top of the hill and look down the dirt path at the thatched-roofed, one-room homes, you can imagine what it must have been like nearly 400 years ago when the first Europeans landed here. Today, those who play the Pilgrims and the members of the Wampanoag tribe all use period implements to make their daily meals. You get a fascinating glimpse into the earliest history of our young country and what it took to just survive. 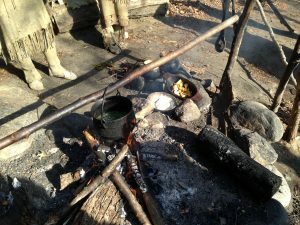 Yesterday, the Wampanoags were making a stew and grinding corn for a dumpling-like topping that will be boiled on top. One Pilgrim woman made hard boiled eggs and will fry some bread that looked like it was hand-made by a child. That will be dinner. Another family was having a small game animal and some vegetables from the late garden. They were all thankful for the bounty they have again this harvest. For me, it is when you see how the women prepared the meals four centuries ago, that the connection to the past is somehow the strongest. Making dinner the old fashioned way – on an open fire. At Plimoth Plantation. Something like 90% of Americans will eat turkey on Thanksgiving Day. But, there is only a small possibility that turkey was served at the first Thanksgiving back in 1621. More likely, fish from the nearby Eel River, oysters from the Atlantic, deer and other small fowl were served during the three day feast to celebrate the harvest and survival of the first treacherous year. Corn (maize) was a key ingredient at the feast. One historian found a description of a corn porridge that was served during the shared feast. Today, we know this dish as grits! Squashes and pumpkins were highly likely to be at that first table, but not in a pie. And, it was unlikely that cranberries were served until quite a few years later. When you look at your own Thanksgiving table, do your dishes harken back to this early-American harvest? Even though we have our own variations on what the traditional meal includes, it is amazing how many of our Thanksgiving traditions take root back to the earliest Pilgrims and the Wampanoag. The food, the feast, the coming together of friends and family is a long honored tradition in the making of our country. It is our shared connection to the past that gives us our hope for the future. It seems that it is even more important today to carry on the tradition of a bountiful Thanksgiving. In a time where we are all rushed and harried and multi-tasking, it is a gift to make the same dishes that our grandmothers or aunts or mothers (and fathers) have been making as long as we can remember. It is a gift to sit at the table with people who are important to us. And, it’s a gift to continue to celebrate our own family’s heritage while remembering the original harvest feast from the early settlers in Plimoth. May you remember those who went before you and enjoy sharing your traditions with those who are with you this Thanksgiving Day.